GVMH Named to "150 Greatest Places to Work in Healthcare"
GVMH Home Services today announced that it has been named to the 2013 HomeCare Elite™ list, a recognition of the top-performing home health agencies in the United States for the fourth year in a row. Now in its eighth year, the HomeCare Elite identifies the top 25 percent of Medicare-certified agencies and highlights the top 100 and top 500 agencies overall. 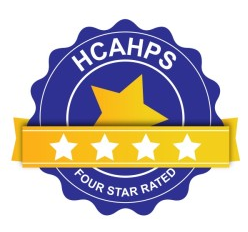 Winners are ranked by an analysis of publicly available performance measures in quality outcomes, best practice (process measure) implementation, patient experience (Home Health CAHPS®), quality improvement and consistency, and financial performance. In order to be considered, an agency must be Medicare-certified and have data for at least one outcome in Home Health Compare. Out of 9,969 agencies considered, 2,496 are elite. Golden Valley Memorial Hospital has been chosen to receive an Excellence in Patient Care award given by outcomes firm Studer Group®. The hospital will receive the award—which will be presented at the 11th annual What's Right in Health Care® conference—for their exemplary "most improved" results on the Hospital Consumer Assessment of Healthcare Providers and Systems (HCAHPS) patient survey. Studer Group® gives its Excellence in Patient Care awards to select partners based on very high scores in a variety of categories. Golden Valley Memorial Hospital was selected based on the amount their HCAHPS composite scores increased from 3Q10 - 2Q11 to 3Q11 - 2Q12. The difference in each composite was taken and Golden Valley Memorial Hospital had one of the largest positive improvements, distinguishing them as "most improved" from over a database of over 850 organizations coached by Studer Group. We utilize state-of-the-art laboratory equipment and integrated information systems. Our laboratory consistently receives certificates of accreditation from both The College of American Pathologists (CAP) and The Centers for Medicare and Medicaid Services Clinical Laboratory Improvement Amendments (CLIA). Golden Valley Medical-Windsor has met all criteria for Laboratory Accreditation by COLA, a national healthcare accreditation organization. Accreditation is given only to laboratories that apply rigid standards of quality in day-to-day operations, demonstrate continued accuracy in the performance of proficiency testing, and pass a rigorous on-site laboratory survey. Golden Valley Medical-Windsor has earned COLA accreditation as a result of long-term commitment to provide quality service to its patients. LifeFlight Eagle Clinton-based crew members Sheila Kauffman, Flight Nurse, Jim Johnson, Base Manager and Joey Araiza, Vice-President of Clinical Services were on hand to present the "Life Saver Award" to Golden Valley Memorial Hospital Emergency Services staff. The award was accepted by hospital CEO Randy Wertz, CNO Mark Mattes and Director of Emergency Services, Debbie Stark. Special guest, Gayle Hunt, also participated in the event. The LifeFlight Eagle "Life Saver Award" is awarded to hospitals, fire departments and EMS agencies in the LifeFlight Eagle service area that demonstrate life-saving critical care response, commitment to improving emergency medical services in their community and focus on improved clinical patient outcomes.